Seeking to Glorify: He's Here! 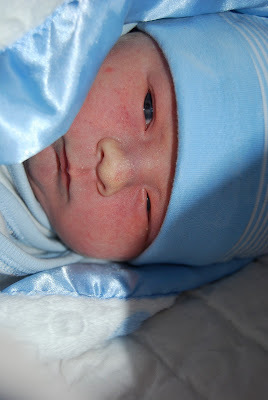 Our little boy arrived on 1/11/11 and weighed 9 lbs 4 oz! I was 5 days overdue. At 7am, on the way to the hospital to be induced, I jokingly said, "Think I can have this baby before noon?" Sure enough, the pitocin was started at 9:15am and our little boy was born by 11:44. Congratulations Shannon! I love his birth date! Grace to you in this wonderful adjustment! Congratulations! What a sweetheart! And born on 1-11-11! Now that's a birthday that will be easy to remember! ooo what a total cutie!! Congratulations!! congrats!! I so wish i could come bring you supper and be with you!! praying for smooth transitions and joyful times for all of you! !